Ocean Key Resort & Spa is a four-star hotel in downtown Key West, the final island of the Florida Keys. This tropical destination is the US mainland's southernmost locale. Key West is reachable via a scenic, two-hour drive from Miami. Many visitors also fly into Key West, typically connecting in Miami or Fort Lauderdale. Ocean Key's most appealing aspect is its sensational Key West location. The 100-room hotel nestles at the end of lively Duval St. and adjacent to Mallory Square, where sunset is a daily public event. The resort's garage has a gate that deposits guests right in the square. Ocean Key's enviable setting makes it the perfect base for exploring everything that quirky, quaint downtown Key West has to offer. Ocean Key Resort's central location also makes it an inspired destination for families. 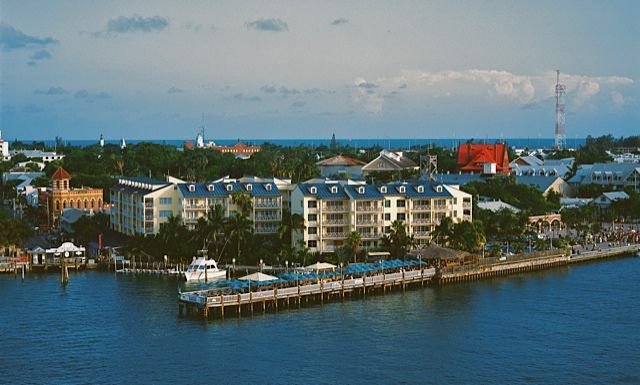 The hotel provides an upscale experience near kid-friendly activities like the Key West trolley and pirate museums. In spite of its proximity to Key West's tourist attractions, Ocean Key feels private and quiet, and manages to cocoon its guests from the hustle of this famous Key. Why Stay at Ocean Key Resort? Ocean Key is a member of Noble House Hotels & Resorts, whose upscale American resorts include Napa's River Terrace Inn and the ultra-romantic Little Palm Island, also in the Florida Keys. Will Ocean Key Resort & Spa in Key West Be Your Style? Ocean Key opened in 1985 and was renovated in 2014. With 100 accommodationsWith 100 accommodations, Ocean Key qualifies as a boutique hotel. Its rooms and suites are spacious and comfortable. • Parking is by valet, for a nightly charge. Guests have full in-and-out car privileges. SpaTerre is a bright and sunny den of relaxation at Ocean Key Resort. SpaTerre offers a range of high-end treatments like expert massages, rejuvenating facials, and skin-renewing scrubs. Ocean Key has a well-outfitted fitness center with a variety of cardio and circuit equipment. The hotel features a popular outdoor pool with ocean views. The main restaurant at Ocean Key Resort, Hot Tin Roof, is named in honor of longtime Key West resident Tennessee Williams. The indoor dining room has a Caribbean estate feel with dark wood floors and deep, cushy, flirtatious booths. If it's not too windy out, outdoor deck tables are equally inviting, especially at sunset. Hot Tin Roof's creative American menu offers classics with a twist, like lobster with polenta, and a colorful wild berry crumble for desert. Sunset Pier, Ocean Key's more casual dining venue, is centered on the colorful outdoor deck. As is common in the travel industry, the Guest Author was provided with a complimentary visit for the purpose of describing the hotel. For details, see our site's Ethics Policy.